Pathway Lighting's designers and engineers, in close collaboration with Centerbrook Architects, developed this custom 9' x 3' LED chandelier for University School — a K-12 preparatory school — just outside of Cleveland, OH. The Architect and Lighting Designer had envisioned a custom fixture that captures and honors the region's manufacturing heritage. 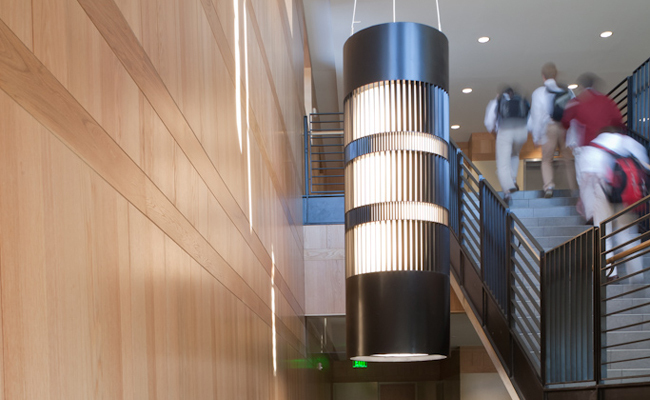 The final product is a unique cylindrical chandelier that provides efficient general illumination and a striking focal point for students and faculty. "...Pathway's design suggestions and engineering were invaluable; I don't know how we would have done it so well without them."